"Today, Wilmington's population continues to grow. State-of-the-art medical facilities, upscale shopping and a wide range of restaurants have flourished..."
During the 1990s, Wilmington evolved into one of the fastest-growing retiree havens in the region, a trend that continues today. The warm weather, nearby beaches and rich history of the area draw people from across the country to call this famed Cape Fear River town home. Founded by English settlers in 1739, the coastal outpost struggled initially because it was virtually inaccessible. The surrounding marshes and tidal pools made overland travel nearly impossible until technological advancements in road and bridge construction brought growth and prosperity. By 1840, Wilmington was a busy shipping port and North Carolina's largest city. By the time the 19th century came to an end, Wilmington had lost that distinction to inland cities in the Piedmont area, and it did not begin to regain its luster until the tourist boom of the 1980s. A decade before, in the 1970s, Wilmington launched a massive preservation project, saving many of its historic homes from ruin and establishing one of the largest historical districts listed on the National Register of Historic Places. Those efforts played a huge role in making Wilmington a top vacation destination. Tourists come from around the world to walk the cobbled streets and view mansions that have been restored to their pre-Civil War glory. Wilmington is indeed an ideal locale for history buffs: spotted with pre-war antebellum mansions, museums and a Civil War battlefield, the area's rich historical traditions have been preserved for generations to come. 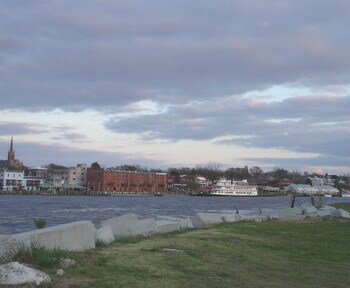 As a result, the movie industry has taken a shine to Wilmington, using the city for external shots and featuring it in several Civil War-era epics. Today, Wilmington's population continues to grow. State-of-the-art medical facilities, upscale shopping and a wide range of restaurants have flourished in the slow-paced community. The area offers residents a wide array of recreational activities from which to choose, including golf, fishing, riverboat cruises, nature trails and bicycling. Or, if you prefer to simply drink in the splendor of Wilmington, you can join the residents and visitors who wander through the streets of the historic district in the springtime, admiring the city's many gardens in full bloom.